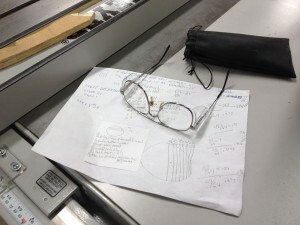 You know how easy it is to say to yourself, “This little task is going to take only a minute, and my safety glasses are on the far side of the shop, I’ll just knock this out real quick.”? The ultimate woodworker, the one we all want to be when we grow up made this saying famous by repeating it week after week on The New Yankee Workshop. We are wise to heed it. 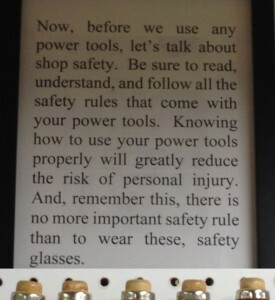 You can buy safety glasses for cheap. Position some around the shop so that they are never far from where you are working. You can have one or two pair of really good goggles or safety glasses, and still have some of these for those out-of-the-way places in the shop that might tempt you to work without going and getting the good ones. And, while you’re at it, place some small squirt bottles of Windex around the shop. 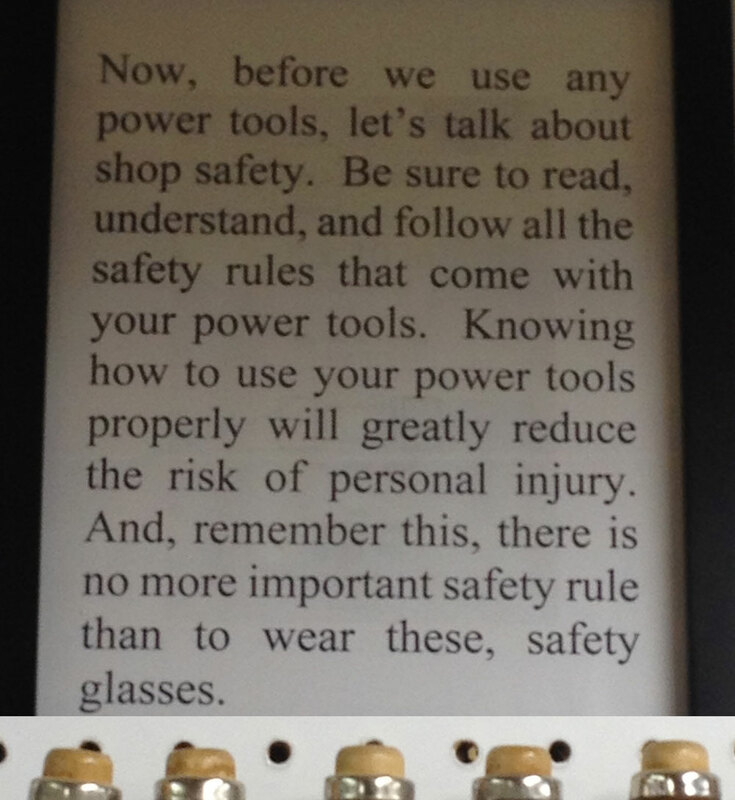 You won’t want to wear those safety glasses if you can’t see out of them. Inability to see clearly is a safety hazard, too. 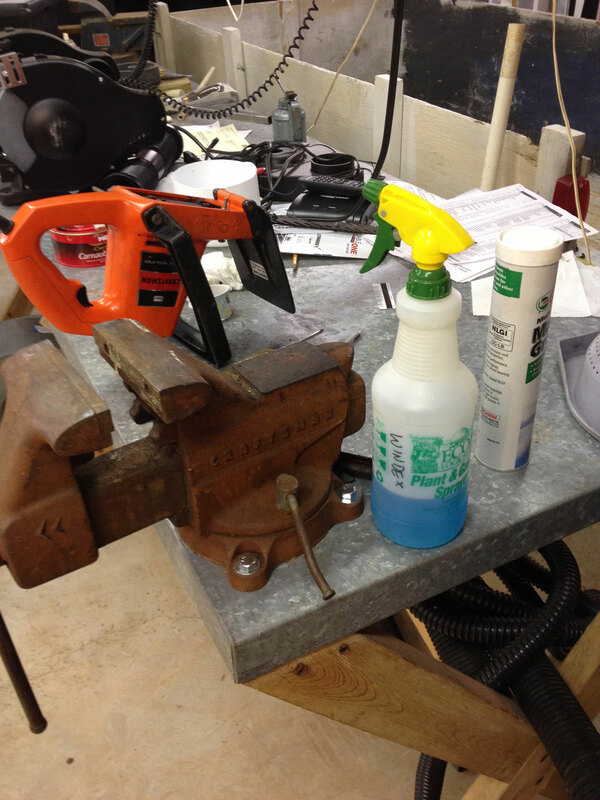 I have one bottle of Windex here on my metalworking table and another near the sink. From this table I’m not far from the vision protectors I use most. I have some really expensive safety glasses, because I believe our eyesight is worth it. They are prescription, so I can see really well. They stay clean and protected in their bag, and they reside next to the table saw. This is a moderately-priced face shield. I didn’t want to go so cheap that the shield would soon scratch or discolor and be useless. 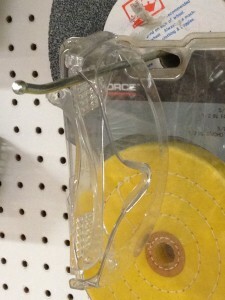 Another plus: replacement shields are available for this unit. 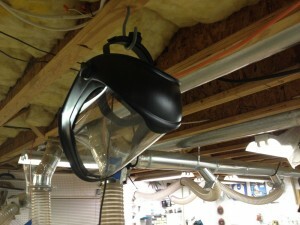 Click here to read Steve Johnson’s review of the Trend Airshield. A Man by the name of Bill Frank came and spoke to us about eye safety,he ran a 10″ X2″ pedestal grinder 2nd shift his pal ran it on days Bill had some time be for he took over his safety glasses stuffed in his back pocket the wheel hit a snag and blue up missed his pal took both Bills eyes out they showed a moked surgery 12 or 15 hours picking sand glass and steel and meat out of his face the guy had to learn to eat walk get dressed everything all over MAN I DONT GO WITH OUT THEM AT ALL, I have a buddy who ran a centerless grinder ,had a end mill shank .100 over size from the Leathe dept. broke the wheel in have one pce. went to the left& one to the right, BE SAFE.